BRUCE CAMPBELL COMES TO THE TOWER! From his turn as Ash in the classic EVIL DEAD horror movie series, to his seven seasons on Burn Notice, to the reprisal of his iconic character in Starz’s Ash vs. Evil Dead, Bruce Campbell has long been a fanboy favorite—and part of the brain trust behind Last Fan Standing. It’s easy to see why: his sharp, self-deprecating wit has made his Comic Con appearances top draws for years. In fact, Bruce's 2015 Comic Con appearance in San Diego was outdrawn only by the panel for Star Wars: The Force Awakens. The long awaited sequel to the New York Times Best Selling Book is here. The follow up to "If Chins Could Kill: Confessions of a B-Movie Actor" hits book store shelves in August. 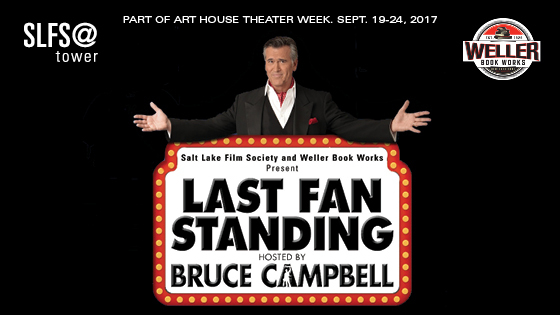 Bruce Campbell goes on a 33 city tour the months of August, September and October of 2017 promoting the new book "Hail to the Chin: Further Confessions of a B-Movie Actor." Last Fan Standing gives the entire audience the chance to play along and qualify to be on stage—and attempt to be The Last Fan Standing. Through provided "audience response devices" (clickers if you insist on getting technical), each audience member participates in a series of multiple choice questions where the players with the first correct answers advance to the Podium Rounds where the top four players from the audience fight a winner-take-all battle of Sci-Fi, Fantasy, Superheroes, and Horror trivia. After each round the player with the lowest score is eliminated, until there is only one . . . Last Fan Standing! $50 - Signed copy of Hail to the Chin, plus a chance to be Last Fan Standing! $100 VIP - Signed copy of Hail to the Chin, plus a chance to be Last Fan Standing! You’ll also meet and greet w/Bruce personally! Watch as sci-fi & horror icon Bruce Campbell drills contestants with tough trivia in front of a live audience, separating the geek from the weak, the nerds from the herd! Bruce Campbell is the grooviest of hosts. It’s the only live game show created exclusively for fans. Last Fan Standing is the ultimate test of pop culture and fandom. More info on the book and the tour can be found at bruce-campbell.com.